The Wild Wild West: The Great Train Heist slot machine contains elements of several beloved NetEnt slots, and rolls them all into one. The iconic graphics of the marvellous Jackhammer franchise, and the splendid gameplay NetEnt is known for, result in a videoslot that will probably become an all-time favourite among gamblers. Forget about The Magnificent Seven. 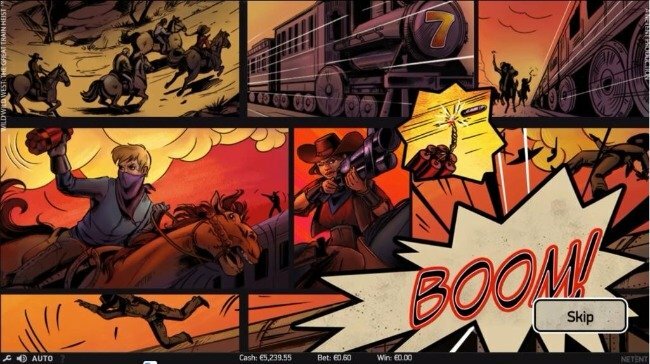 NetEnt has combined their artistic Jack Hammer comic book style, with the traditional heist and Western slot themes to come up with their new Wild Wild West: The Great Train Heist slot. As you will see in our Wild Wild West: The Great Train Heist slot review, this is a game which contains a petite but endearing structure. The question is whether the The Great Train Heist impresses? What is unique about this game is that NetEnt appears to have taken the comic book style graphics of their much-loved Jack Hammer, and Jack Hammer 2 slot machines, and processed them into the design of this game. The Wild Wild West: The Great Train heist video slot is a nifty looking new slot and one which is quite unlike other western themed slots on the net. 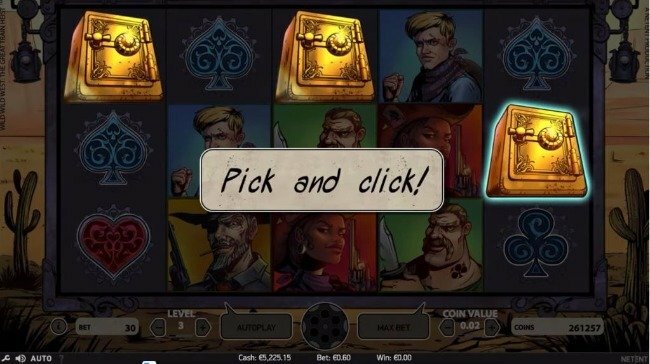 Expect to find playing card suit symbols, as well as various gunslingers in the Wild Wild West: The Great Train Heist online slot, as well as comic book style wilds, and safe symbols which can bolster your chances of landing a big win. With just 10 paylines present on its 5 reels, there isn’t a whole lot of finagling a player can do with their wagers in the Wild Wild West: The Great Train Heist game. Players can choose coin denominations which range from 0.01 up to 1.00, and bet as many as 10 of those per line. This will naturally see the slot contain floor and ceiling bets of 0.10 per spin, and 100.00 per spin, respectively. 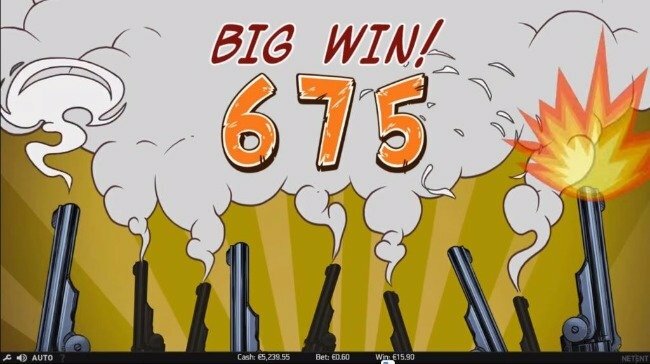 The Wild Wild West: The Great Train Heist slot RTP rate is fixed at a respectable 96.7%, meaning that you are never very far away from your next big wins. As for the top prize, the jackpot is non-progressive and is worth roughly 500 coins. Players need to land 5 wilds on a line to walk away with the loot. Wild symbols appear as comic book style text. This powerful symbols can replace all other icons in the game, barring scatter and bonus symbols. They are also responsible for the non-progressive jackpot as we’ve mentioned. Scatter icons (free spin symbols) can appear anywhere on the reels in the base game and offer a Wild Wild West: The Great Train Heist free spins bonus if 3 or more land on the reels. Players can expect to bag 10, 20 or 30 free spins for 3, 4, or 5 such symbols appearing in any position on the screen during a single spin. During the free spins bonus, players can prosper from enhanced wilds. All wild symbols can randomly transform into one of four types of wilds. Those wilds include regular wilds, expanding wilds, 2x multiplier wilds, or spreading wilds. The number of Wild Wild West: The Great Train Heist slot bonuses is decent, at two in all. Players who land 3 of the safe bonus symbols on the first, third and fifth reels can trigger a pick and click feature. This second Wild Wild West: The Great Train Heist bonus game can see you able to select from several symbols to bag instant cash prizes worth between 5x and 50x your total bet. A great slot, or will you be held to ransom? There is certainly a great deal on offer in this game. The Wild Wild West: The Great Train Heist slot machine contains elements of several much loved NetEnt slots, and rolls them all into one. If you like Dead or Alive, and their Jack Hammer slot; you will love this slot, as it is a fusion of both of those games.